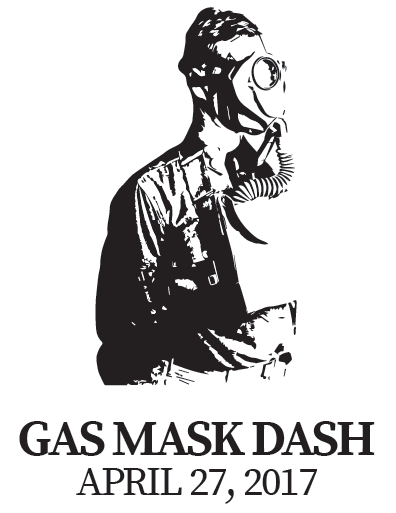 The Edgewood Chemical Biological Center (ECBC) 100th Anniversary Gas Mask Dash is a 5K race and 2 mile fun run/walk that celebrates ECBC’s legacy of protecting our warfighters. Runners won’t wear gas masks, but will sport T-shirts depicting World War I and modern gas masks to honor the Soldiers, Sailors, Airmen and Marines who have carried and worn ECBC-designed masks for protection on the battlefield over the past century. Race t-shirts are guaranteed to all 5k & 2 mile participants registered by April 14 (availability and sizes cannot be guaranteed for those registering after the 14th). Water will be available on the 5k course, and course marshals will direct racers at all turns. Race packets will be available for pickup on Thursday, April 27 (race day) beginning at 7:00 AM at Hoyle Gym.